We have a Lunar Eclipse in Libra on March 23rd 2016 which signals the end of an era. You have been on a roller-coaster of changes ever since October 2013 and your life probably looks vastly different than it did three years ago. This is even more so if you are a Libra, Aries Cancer or Capricorn. This final eclipse in this series concludes an intense period of relationship and lifestyle changes, writing the epilogue to your recent adventures… It’s a wrap! Time to tidy up loose ends and restore your life’s balance! This is a Penumbral Lunar Eclipse (the Moon only passes through the outskirts of the earth’s shadow) and not as potent as the blood moons of 2014 and 2015. Nonetheless, it could pack a punch, especially if you have one final lesson to complete. By autumn of 2016 you will be ready to make a brand new beginning in your life - whether this is at home, at work, in your finances or relationships, or wherever the Aries-Libra series of eclipses have hit you hardest. Want to know more about eclipses? Read about lunar eclipses and what to expect, or take a glimpse at all the eclipses for 2016. 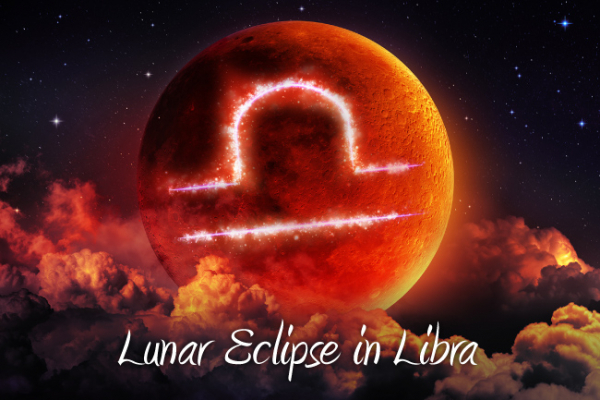 How does the Lunar Eclipse in Libra affect your Sign? A roller-coaster of changes that began back in the autumn of 2013 finally begins to wind down. How have these eclipses affected your star-sign and what can you expect this March? Read on to find out! And remember: you can always get the personal touch by calling our gifted psychics for a reading! The number is 0207 111 6384. The past three years have brought powerful changes in your interpersonal relationships, even urging you to change your appearance and outlook on life. It is time for these changes to draw to a close. If an important relationship has been in a state of uncertainty for a while, you will now receive the final piece of the puzzle, giving you the clarity and energy you need to move forward. An immigration, travel, educational or legal matter may be of assistance here to help you move on, but ultimately it is your own strength, faith and charisma that pulls you through. Things can turn out very positive indeed, finally opening the path for you to make a brand new start in your relationships this autumn. Make sure to look the part by reading our weekly fashion horoscope! A challenging period around work and health matters finally begins to wind down, during which you no doubt had to make many personal sacrifices. You may find yourself with a job vastly different to what you did before, a new daily exercise routine or a whole different life-style. (Check out our weekly fitness horoscope to stay motivated!) If a work or health matter has been pending, then this eclipse will bring a final round of adjustments and insights to help you settle into your final routine. You may find that an important commission accelerates changes at work, or that you have the energy to make further changes to your diet and exercise to improve your health. You have been through a lot of stress, dear Taurus, but you are now entering the final stretch: by autumn this year, you will be ready to settle into a far more rewarding, efficient and healthier way of life. Your heart has been on an incredible rollercoaster for the past three years. You may have fallen in love, rejoiced over the birth of a child, or awakened your creative and business talents. You now have an opportunity that makes your heart flutter, whether you are looking for love, launching your own business or trying for a child. An important someone in your life will have much to do with this, bringing you joy or rekindling the spark between you. Or it may be your friends who bring you clarity, or a business partner giving your creative project a much needed boost. March brings much welcome activity to gladden your heart. Let it in, dear Gemini, and by autumn this year, you will be ready to make a brand new start in your love life or with a project dear to you. Keep your heart open with your daily dose of today’s love horoscope! The past three years have seen your home-base, family and career undergo unbelievable changes. Who could have foreseen back in early 2013 the shape that your life would eventually take? (Actually our amazing stargazers could, give them a call on 0207 111 6384!) This journey has been unsettling, but you are used to it by now and it’s time for the whole adventure to come to a close. If a family or real-estate matter has been pending, this eclipse will deliver a final piece of news to help you move forward. This will most likely be of a professional nature - news about a boss, job, or promotion that bring you clarity. But it may also be family responsibilities and changes to your daily routine that require adjustments now. Take heart, dear Cancer, for by autumn 2016, you will be ready to establish a brand new home for yourself, start a family or build your life on a new foundation. The past three years have literally seen you go back to school, change the way you think about the world and experiment with a variety of new ideas. School’s ‘out’. It’s time for you to take what you’ve learned and move on. If you’ve been waiting for an important piece of information to answer a question in your mind, this eclipse will deliver it. If you work in communications, then changes to the way you work will energise your vision bringing joy and hope for the future. An exotic flirtation may be the catalyst for a trip or other change in your daily movements. Sibling rivalry may now flare up one last time then die down. This eclipse heralds happier times, dear Leo. By autumn 2016, you will be open to new romantic proposals and ready to network afresh. Ever wondered about which planet it is that looks after your interests? Find out in Your Ruling Planet, Personality and Appearance! You’ve been on a money merry-go-round for three years now and it's likely that your own source of income as well as that of your partner or household are radically different to what they were back in 2013. The whole financial weight of your circumstances may have shifted radically and it’s time to re-balance your accounts. If you’ve been struggling financially, then this eclipse will bring the clarity and strength you need to review your source of income and make the best of your talents. You can count on your own strength, as well as the support of your family as you do so. A loan, commission or other financial arrangement can also assist you to put your plans into action. Let these changes take hold, dear Virgo. By autumn this year, you will be in a much better position to exploit your talents and improve your financial position. Get added support and encouragement while you wait by reading your Chinese horoscope for the whole year ahead, 2016! You’ve been in the eye of a storm for three years now with your personal desires and relationships all thrown up in the air. This final lunar eclipse in your sign allows you to finally get some closure. If you have been in limbo waiting for a dispute to end or for an important relationship to finally settle, this eclipse will deliver the information you need to get to the finish line. You may receive news, have a heart to heart with someone or draw up the necessary legal papers now to put the whole affair behind you. Try our free Celtic Cross Love Tarot Reading to see what this might mean for you. And take heart, dear Libra, for by this autumn you will begin a wonderful new phase of your life that will take you through the next decade, full of love, growth and discovery. The past three years have made great demands on you, forcing you to make sacrifices and put up with much that was out of your control. Your own needs have taken a back seat in all this and it’s time for this to change. If office politics have been doing your head in, then events at work will deliver the final blow to those who wish to undermine you. If you have been sidelined due to no fault of your own, or worn down to the bone, then a helpful assistant may arrive now to get you back in your stride. But ultimately, it is your own charisma, talents and resources that speak for themselves, as well as the work that you have put in. A health matter can also see swift developments now. Act quickly. By this autumn, you can put this entire period behind you and no longer hide in the shadows. Meanwhile, you can find daily guidance in our psychic blog. You have been on an incredible journey for the past three years, trying your best to realise your life’s ambitions, re-discover romance or give your social network a total overhaul through new friends and allies. It’s time for the final act in this adventure. If you have been working towards a collaborative project or something close to your heart, rapid developments may help you realise this dream now. If a relationship has been balancing between love and friendship, events now will tip it one way or the other. You may want to express your love for someone now or bring your personal creativity more clearly to bear on your project. You are the deciding factor in all this. If more maturity is called for on your part and you feel at a bit of a loss then why not check out your numerology maturity number for some clues? By autumn this year, you will be ready to network and pursue your dreams unencumbered. Your public image has transformed beyond recognition over the past three years. Maybe you went from housewife to business woman or from free-lancer to employee? Or maybe you retired or even changed your look? It’s time to settle into this new direction your life has taken. If there is still uncertainty as to where you are headed, events around your home-base and family now will clarify matters. Try our weekly career horoscope for added assurance, if you feel somewhat on edge. People and places from your past have a part to play in what happens in your career now. Alternatively, it may be your psychology and personal circumstances that make certain changes necessary. Office politics may also precipitate professional adjustments. Let it be, dear Capricorn: by autumn this year, you will be ready to set new goals. The past three years put your beliefs to the test, removing all that is familiar and pushing you toward the unknown. This lunar eclipse represents one final test of your faith. If a legal matter has been pending, a decision now will put an end to it. If you have been trying to expand your business abroad, gain a degree or market yourself, you may come across people and ideas to help you along. Your friends are your greatest asset just now, so do your best to network and to keep your allies close. By autumn this year, your risk-taking will have paid off. You will have more freedom, a wider arena in which to operate and you'll be ready for new adventures. Get a taste of the exotic right now by checking out your Daily Chinese Horoscope! Your finances have been through more ups and downs than a yo-yo in the past few years. One minute you are doing great and the other something unforeseen happens to leave you breathless. But you are about to enter a far more stable financial phase. If you are waiting to hear about a grant or commission, or trying to sort out a loan, tax or other financial matter, this eclipse will deliver the news you are waiting for. Alternatively, if your partner’s finances have been unstable, a final round of changes will set them straight. (Our daily money horoscope can meanwhile provide you with the support you need.) Authority figures will also look favourably upon you now and aid your cause. Your own prestige and talents speak loudly for you in any case. Your finances are about to receive a boost from autumn this year, so cheer up, dear Pisces!